According to a statement bu the University the first Lady was houred due to her selflesss humanitarian works. “She’s a humanitarian who has dedicated her life to working for the less privileged in Nigeria and Africa especially for women and children. 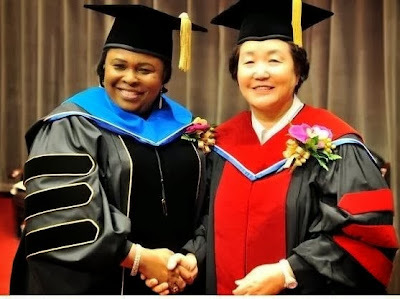 Her vision as the defender of the poor in Nigeria fits into Hansei University’s motto of a practising Christian. Now she’s part of our community. Hmmmmm Congrats ohh madame patience..hmmmmm..